(Left to right) Takashi Honda (D.D.S. ’47), Brent Honda (D.D.S. ’17) and Randall Honda (D.D.S. ’78) have some fun in the School of Dentistry following Brent’s graduation in 2017. When Larry Fujioka (D.D.S. ’79) stepped off the plane at Kansas City International Airport in 1975, one of the first people he saw was his childhood friend, Randall Honda (D.D.S. ’78). The two young men both moved from Hawaii to study dentistry at UMKC, and would soon become roommates and remain lifelong friends. Fujioka had no way of knowing that, more than 30 years later, he would sit across a table from Honda’s son, interviewing him for a scholarship to attend the UMKC School of Dentistry, just like his dad. long history of friendship between UMKC and Hawaiians of Japanese descent. Meanwhile, Roy J. Rinehart was in the midst of his second decade as dean of the School of Dentistry at what was then known as the University of Kansas City (UKC). When Rinehart heard that students across the West Coast were being expelled from their schools, and worse, imprisoned, he didn’t stand idly by. Over the next several years, Rinehart made it his mission to help Japanese-Americans escape internment camps and study at UKC. In the early 1940s, he even traveled to California to sign papers releasing a young man from a detention camp. Rinehart loaded the student into his car and drove him to Kansas City in time for class. It’s just one story that illustrates the forward thinking of a man who lived more than six decades ago. Dean Rinehart’s generosity was not forgotten. In fact, it has sparked a decades-long friendship between two unlikely communities: Kansas City, Missouri, and the islands of Hawaii, where so many are of Japanese heritage. Since the 1940s, the UMKC School of Dentistry has accepted several Hawaiian students each year, often on scholarship. Many of those early students arrived in Kansas City having never been to the Midwest, and sometimes, having never left the islands of Hawaii. alumni such as George Tanaka (D.D.S. ’49), Russell Tabata (D.D.S. ’67) and, now, Fujioka. Fujioka and Tabata are part of the group tasked with selecting worthy young Hawaiians to study at UMKC, but more importantly, to be caretakers of this special relationship. “During the interview process, Dr. Tabata and I always make sure the applicants know why UMKC is even offering positions in the school — because of this connection with the Hawaiian alumni,” Fujioka says. Like many Hawaiian alumni, Fujioka chose UMKC because of its unique history. After Pearl Harbor, Fujioka’s father was expelled from the school in California where he was studying dentistry. He was sent to an internment camp, but avoided a lengthy sentence by enrolling at Drake University and eventually finishing dental school at St. Louis University. 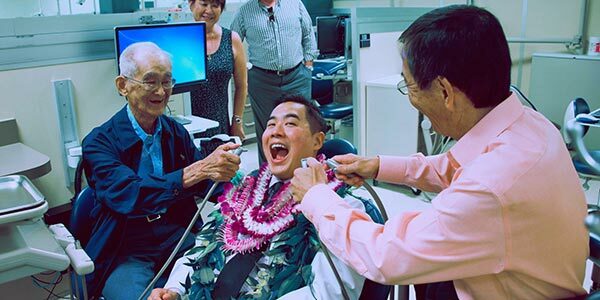 When it came time to choose his own dental school, Fujioka knew he wanted to apply somewhere with that same history of inclusion. That’s when he heard about UMKC.